Letters From A Tapehead: Big Walnuts Yonder: "Raise the Drawbridges?" 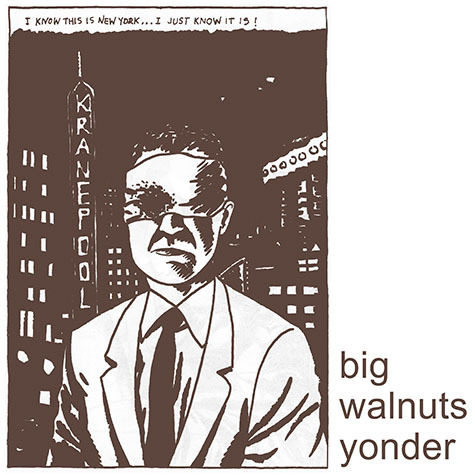 Big Walnuts Yonder: "Raise the Drawbridges?" The Indie Rock: Then & Now of bands: Big Walnuts Yonder brings together Mike Watt (Minutemen, fIREHOSE), Nels Cline (Wilco), Greg Saunier (Deerhoof), and Nick Reinhart (Tera Melos), combining over thirty years of fringe-based rock n' roll lineage. The group's first single, "Raise the Drawbridges?," captures well the distinct musical sensibility of each member, from Watt's unmistakable low-end harmonic to Saunier's thunderous snare, synthesizing their respective personalities into an energized and very fun two-minutes and twenty seconds. The song premiered over at Consequence of Sound. The cover illustration is from the able hand and characteristically dark mind of Raymond Pettibon. Big Walnuts Yonder's self-titled debut is scheduled to release on May 5th via the reliably awesome Sargent House label. You can listen to "Raise the Drawbridges?" with the Soundcloud link below. All info and links were provided by Us/Them Group. Big Walnuts Yonder premiere the first track from their forthcoming debut full length today via Consequence of Sound. The impetus for Big Walnuts Yonder came about way back in 2008 from a conversation between Watt and Reinhart while their bands toured together in Japan. The two discussed recording together and who they might bring in to the sessions. "Nick gets a hold of my first opera," Watt explains. "Made in 1997 with Nels Cline. He said 'what's it like playing with Nels?'"